The PXM409 High Speed USBH Series connects directly to your computer. The micro-machined silicon design are ideal for pressure or level applications in laboratory, test platforms, or bio/pharmaceutical applications as well as industrial applications that require a rugged, high accuracy transducer. 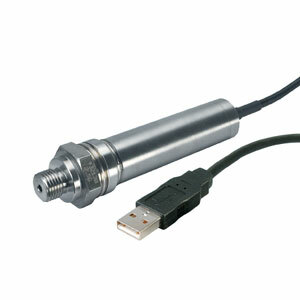 This sensor provides a very stable transducer with exceptional high accuracy of ±0.08% and a broad compensated range of ‑29 to 85°C (-20 to 185°F). The modular construction allows for fast delivery of most configurations and fittings. Free OMEGA PC software takes the data from the transmitter directly to the digital domain, turning your laptop or Windows® tablet into a virtual meter, chart recorder, or data logger. Also included are .NET APIs and a command set for command-line access. (Includes software to run TRH Central compatible devices). 注: Comes complete with 5-point NIST traceable calibration, downloadable digital readout and logging software, .NET drivers, and command set.